Nancy is the founder and trainer at Inner Strength Pilates. She works hard to make sure every client understands how to find and use their core muscles. These are the deep abdominal, back, pelvic floor and breathing muscles. They are key to efficient performance, endurance, injury prevention and recovery. After working for 16 years in a high-profile, corporate job Nancy has focused her energy on health and fitness. 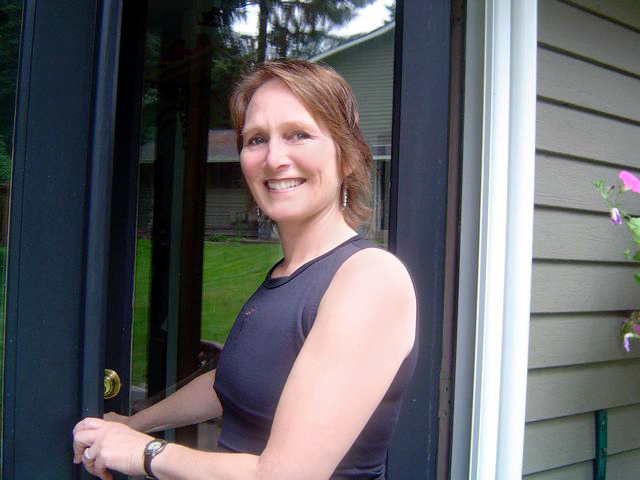 She founded Inner Strength Pilates in Sammamish WA in 2004. She is certified in STOTT PILATES® (Advanced level) Yamuna Body Rolling, Yamuna Foot Fitness , Zenga, Total Barre, Fascial Fitness, Marie Jose Blom’s SmartSpine Pilates, and is a Reiki Master, Holy Fire Level III. Nancy completed her first STOTT PILATES® certification at Body Center Studios in Seattle (2005), and has studied with Pilates veteran Michelle Hoyos since 2000. She studied the Aston paradigm with Judith Aston in California (2007) and has completed several workshops with Eric Franklin and the Franklin Method (2006-present). She has been practicing Yamuna Body Rolling since 1999; and certified in Yamuna Foot Fitness with Yamuna Zake (2010 & 2011) and as a Yamuna Body Rolling practitioner in 2010. Nancy is also trained in Tom Meyers’, ‘Anatomy Trains for Movement Therapists’ (2010). Nancy has spent several years focusing on training individuals with bone density, shoulder problems and unique presentations of pain or imbalance. She works with nationally ranked athletes desiring to improve their performance, athletic adolescents with changing bodies that demand continued proficiency, and the 60-70 year old crowd refining their athletic training. Her swim team clients have learned how to balance their shoulder working to avoid rotator cuff injuries. While her clients with impaired mobility have increased their activity level. Currently she teaches workshops on Pilates for Osteoporosis, Working Though Asymmetry, and Yamuna Foot Fitness as well as the appointments and classes at the Howling Dog Studio. Nancy has also developed and received a patent for a product called the ChairBox, an accessory for the Pilates Stability Chair that makes the work more accessable for people taller than 5’7″. Nancy has spent over 25 years observing the causes and alleviators of pain. Core strengthening through pilates and the other techniques mentioned above have proven to be the most effective. The recent addition of foot fitness has added the missing link to enhancing knee and hip stability. Nancy’s empathetic style and keen awareness allow her to develop routines that help clients learn to improve themselves. Her own athletic experience includes years of running, swimming, hiking, cycling, skiing, kayaking, canoeing, dog sledding and weight training. Nancy has taught Mat at Columbia Fitness Issaquah, FPCB Athletics (Prayerful Pilates) and Dry Land Training for the Pine Lake Club’s CAC Swim Team, Skyline High School Swim Team and the Issaquah Swim Team (USAA). Nancy’s love for teaching and the inspiration of Pilates and Movement training have allowed her to develop training workshops for Continuing Education Credits (CECs) for movement therapy professionals and the avid layperson.